Click2Clone is one of our popular Dynamics 365 CRM Productivity App which assists you to clone your Dynamics 365 CRM records in a single click. Our solution supports Dynamics CRM version starting CRM2013 and all deployment models which means it doesn’t matter if you are on CRM Online, On-Premise or IFD you will very much be able to leverage the benefits of our solution. You can just download the solution and start your 15days trial right away and experience the ease of Cloning your MS CRM records at the click of a button. You can download Click2Clone solution from our website or Appsource. 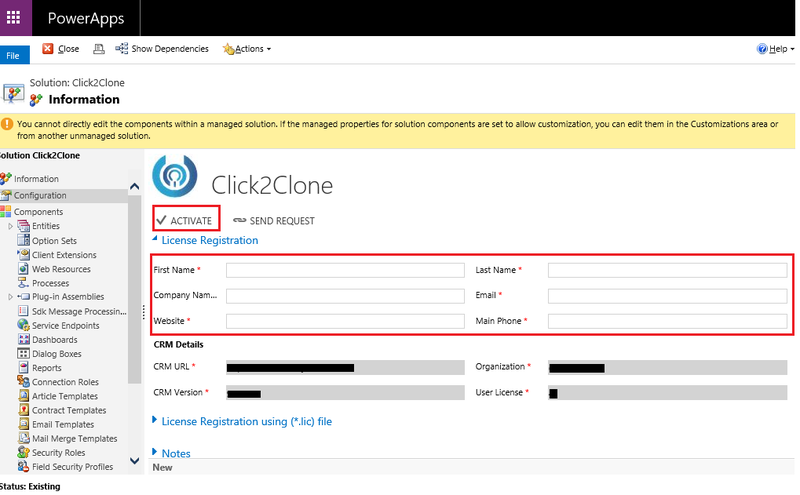 Click2Clone provides this ‘Clone’ feature for commonly used OOB entities as well as supports cloning for custom entities as well. It also allows carrying over related records from 1:N and N:N relationships. We have recently added some new helpful features like Hierarchical Relationship Cloning, Cloning records using Workflows and Prefix & Suffix configuration for cloned records and the users are loving it!! 1. Download the solution from our website or Microsoft Appsource. 2. Navigate to Settings -> Solutions and import the downloaded solution. 3. 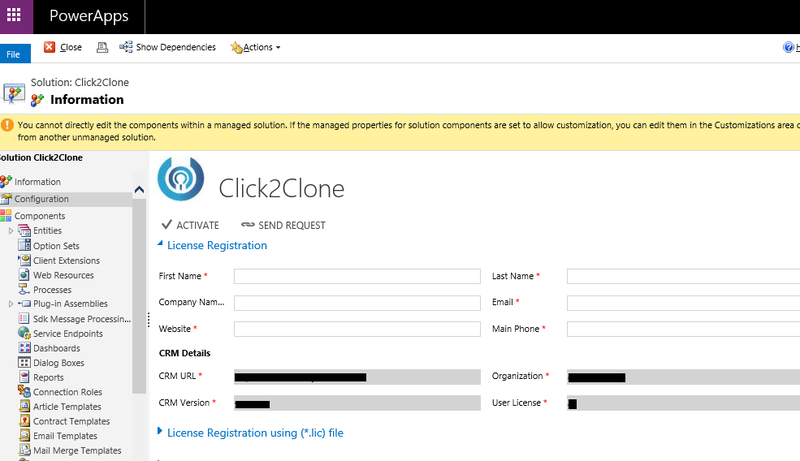 Once you have imported the solution navigate to Solutions -> Click2Clone solution -> Configuration. 4. Here you will need to fill in your CRM details and then click on the ACTIVATE button as shown below. On click of this button, a 15 days trial license will be activated immediately for your organization. you will receive a ‘Click2Clone.zip” file from us, kindly follow the below steps to activate the Click2Clone license. 2. Now extract the attached zip file to find the Click2Clone.lic file. 3. Then from the Click2Clone configuration window browse the “lic” file and click on the Register button as shown below, to register the application for use. After successfully registering Click2Clone solution, you are ready to simplify the process of creating new records, Click2Clone significantly reduces the time spent on redundant data entry. For more information on our Dynamics 365 CRM Productivity Apps visit our Website or AppSource or contact us at crm@inogic.com.